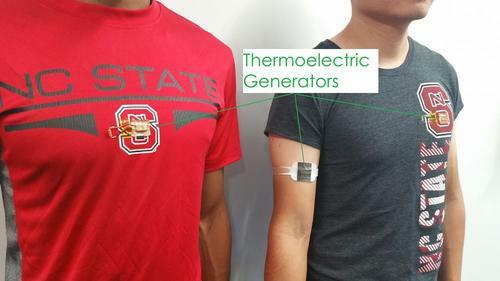 A lightweight device developed by researchers at North Carolina State University (NCSU) that turns body heat into electricity is the latest potential alternative to batteries for wearable technology. The device, a wearable thermoelectric generator (TEG) that makes use of the temperature differential between a person’s body and the ambient air to generate electricity, is the work of researchers at the Advanced Self-power Systems of Integrated System Technology (ASSIST) center, which is funded by the National Science Foundation and led by NCSU, said Daryoosh Vashaee, an associate professor of electrical and computer engineering at NC State and one of the researchers on the project. Researchers at ASSIST focus on a number of projects to develop low-power wearable sensors, such as ECG sensors for heart monitoring, glucose sensors, and ozone sensors to prevent asthma attacks. The new device is aimed at providing a power source for them that precludes the need for batteries, Vashaee said. The new TEG design is based on the thermoelectric effect, using material that generates voltage once there is a temperature gradient across the material, such as when one side is hot and one is side cold, he explained. “We synthesized thermoelectric materials that are most efficient for operation with body temperature,” he said. “In the next step, we fabricated wearable generators out of these materials that can generate useful power just from body heat. The generator is a three-layer structure consisting of the thermoelectric legs and flexible thermal spreaders on both sides." At the base of the new TEG design is a layer of thermally conductive material that rests on the skin and spreads the heat. The conductive material is topped with a polymer layer that prevents the heat from dissipating to the outside air, forcing the body heat to pass through the TEG. Heat that is not converted into electricity passes through the TEG into an outer layer of thermally conductive material, which rapidly dissipates the heat. The prototype TEG is one centimeter squared, but it can scale up depending on the power needs of a device, Vashaee said. In addition to designing the device, researchers also found what they believe is the best place for it on a person’s body for optimal heat harvesting -- the upper arm. While the skin temperature is higher around the wrist, researchers found that the irregular shape of the wrist limited the surface area of contact between the TEG band and the skin. They also tested it on the chest, but wearing the band on the chest limited air flow and thus heat dissipation since the chest is normally covered by clothing, they said. When worn on the upper arm, the device can generate up to 20 µW/cm2 of power. However, Vashaee and his team also integrated the TEG into T-shirts and tested them on people exercising. The tests showed that the TEGs still can generate 6 µW/cm2 and as much as 16 µW/cm2 if a person is running. Researchers published a paper on their work in the journal, Applied Energy. They plan to continue the project to produce even more efficient TEGs using new materials, as well as to continue to test the generators in real-world products, Vashaee said.